Real Life According to Emma: Introducing the next generation of #bookbloggers on @BestChickLit #KidLitChat for my Children's Fiction Blog Tour. 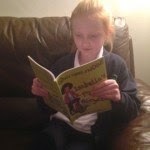 Introducing the next generation of #bookbloggers on @BestChickLit #KidLitChat for my Children's Fiction Blog Tour. Today I am pleased to share with you the content from BestChickLit.com . 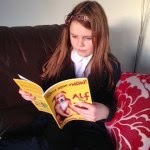 They recently featured my 'Once Upon a NOW' series of children's books and introduced the world to super-reviewers Ellie and Eden (aged 11 and 9). 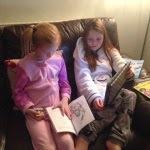 Both girls read the books and between them created 5 wonderful reviews for 'Alf The Workshop Dog', 'Isabella's Pink Bicycle' and 'Kool Kid Kruncha and The High Trapeze'. Coming up with one review is hard enough against a deadline, but these sisters have really got the reading bug. They are destined, I am certain, to become great literary star-reviewers of the future. The pair managed to read all three stories and came up with synopses of the plots as well as explaining the things they particularly enjoyed in each book. A big thank you from me to them for all their effort and fantastic result! (particularly as they liked the stories ;-) ). Visit the blog and see all their thoughts and reviews on BestChickLit.com. Kindle version of 'Kool Kid Kruncha and the High Trapeze' is FREE on Amazon Worldwide today & tomorrow (27/28 Jan 2015) http://www.smarturl.it/Kruncha. Next stop on the tour is Tales of Yesterday readable from the 28th January.